Beautiful and very popular villa which has Full air-conditioning and Complimentary wifi .This villa is situated on the very popular development of vistalobos with spectacular sea views to feurteventura . The villa has been furnished to an exceptionally high standard. The very spacious lounge area has 2 seating areas with a 47 inch smart tv.Dvd player/games console with a selection of games and dvds and a 4x7 slated pool table .It has 4 bedrooms.2 upstairs and 2 downstairs .The master bedroom which is located upstairs boast a super king size bed and ensuite.The junior suite is also located upstairs has a double bed and ensuite.The third bedroom is located downstairs which has a king size bed and a private terrace and the forth bedroom has 2 single beds.Both downstairs bedrooms share a large family bathroom with walk in shower and jacuzzi bath.Double sink and toilet. The pool area is surrounded by lovely flowering plants which adds to the beauty and privacy and of the pool area. The pool is a salt chlorinated which is more kind on children skin as no harsh chemicals are being used. Bedrooms 3 and 4 share a large family bathroom with toilet , shower and jacuzzi bath . There are 8 sunloungers provided at the poolside . The BBQ area has a large seating cushioned area plus outside dinning area . En suite to master bedroom shower/bath WC. En suite to junior suite, shower and WC. Main bathroom shower, WC and Jacuzzi bath. This spacious (90 sq.m.) living room has 2 large separate seating areas. Entertainment area including 47 inch LCD TV. DVD player, games console with a selection of games and movies. Also a professional 7x4 slate pool table. Fully fitted modern kitchen complete with oven, hob, full size fridge, integrated microwave, toaster, kettle,coffee machine and dishwasher. 18 hole golf course in Costa Teguise approx 40 mins by car or taxi. Notes on accommodation: There are 3 south facing terraces set on different levels, private heated 8m x 4m swimming pool, hot tub/spa, outside shower, an outside Canarian BBQ, sun loungers and 2 outside dinning furniture. The villa is fully alarmed and has parking for 2 cars, an intercom entry system. There is also another gate leading to pool area for added privacy and security. Welcome pack provided. Outside: Very spacious private pool area with 8 sun loungers. Poolside table and chairs. 6 seater outside dining table and chairs. Hot tub suitable for up to 6 adults. 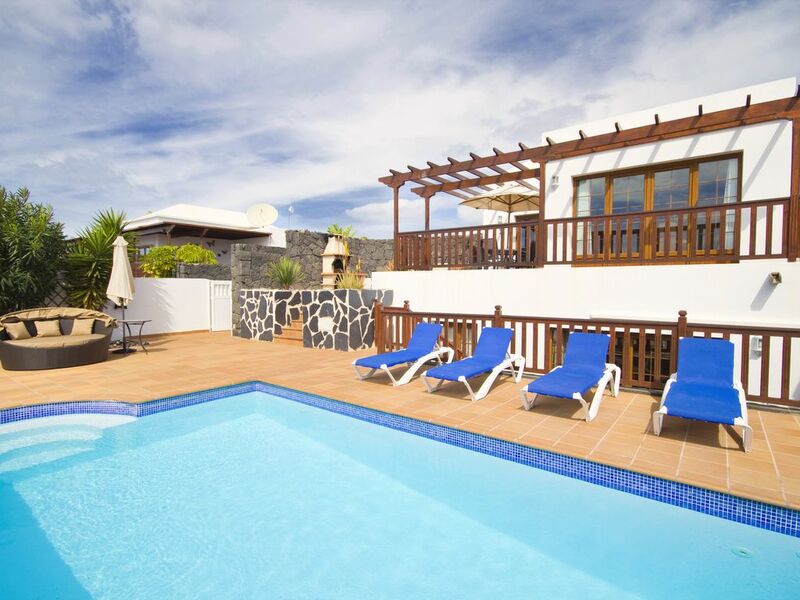 Heated 8m x 4m private swimming pool.Spectacular sea views of Fuerteventura Utility Room: Fully covered salana with washing machine, iron, ironing board and clothes airer. Cleaning / Towels / Linen / Maid service: Bed linen and towels are provided. The bed linen and towels are changed weekly .Mid week towel change also. Pool towels are also provided for your convenience. Other: The large dining room with sea views can seat up to 8 people comfortably. For your convenience air conditioning is available also. Had a fabulous stay. The property was spacious and clean and as described. The villa was a good 20 minute walk from a reasonable supermarket type store but the location was nice and quiet although a car/bike was very useful particularly to get to some of the lovely beaches at Papagayos. Pool was fabulous as was hot tub once it was up and running again. Kids and adults really enjoyed pool table. Could do with an update on kitchen appliances and an extension to crockery available which was run down and there are a few repairs needed but understand these are in hand. Both the new property management and owners were responsive and helpful before and during our stay. Would recommend this property. Stayed here with my wife and children in November for a week but wish we were there for longer ! we thoroughly enjoyed our stay. The villa was a great size and very tastefully decorated could not fault it ! The outside dining and pool area is stunning was ideal for us kids loved the pool and the hot tub was a bonus. The villa is in a great location quiet but plenty amenities around and a taxi rank right outside the complex that costs little if nothing. We will definitely be returning again we have already been in contact about booking for later this year. Delighted you and your family enjoyed the villa . I look forward to taking your booking for this year ..
We have stayed in the villa for half term, a party of 8, two families of 2 adults and 2 children. The layout of the villa is brilliant with plenty of space, ensuite bathrooms and a fabulous pool which was lovely and warm. Tons of lovely big fluffy towels were supplied, unlike some places where you have to take your own or get just a few. The villa was super clean, spacious and very easy to be in. You can walk to Playa Blanca but you can't walk back at night as the route is too dark, however a taxi is about 4 euros so it really wasn't a drama. Playa Blanca itself was really good and child friendly, our kids had a brilliant Halloween dressed up running around on the beach and all of the restaurant owners along the main drag gave them sweets without them asking, which was really nice. The glass bottom boat from the Port to Papagoya beach for snorkelling was a lovely afternoon out. All in all I would recommend this villa for families with children of any age. Zeer goed onderhouden en centraal gelegen villa met zeezicht, privé zwembad en jacuzzi. Hartelijk ontvangst en rondleiding door villa door manager, fles wijn en eerste levensbehoeften in koelkast, heel plezierig. Mooie schone en zeer ruime villa, goede bedden, prachtig uitzicht op zee. Rustige straat, dicht bij playa Blanca. Zwembad verwarmd en van goed formaat, jacuzzi en uitgebreid tuin/zonmeubilair. Goede wifi en tv. Jans it was a pleasure to have you and your family stay. The nearest beach is Playa Flamingo is approx 10 mins walk or 2 min by car. There are also 2 other beaches in Playa Blanca and a little further out the fabulous Papagayo beaches are well worth a visit. Playa Dorado beach has plenty of water sports with bars and restaurants along the promonade..
PlayFlamingo beach is a gorgeous man made beach.Ideal for young families which also boast restaurants and bars along its promonade..
Papaygayo beach is a natural unspoiled beach .which is very popular with locals. The airport for Lanzarote is Arrecife and is approx 30km from playa blanca by car or taxi. A taxi will cost approx 40 euro.car hire is not essential.Punta Limones 15 mins walk (ferry port to Fuerteventura). Playa Blanca town centre 10 -15 mins walk or 3 mins by car/taxi.Cost for taxi 4 euros. Marina Rubicon 5 mins by car/taxi.Yaiza 15 mins by car. Playa Blanca has a large pedestrian shopping area with an abundance of shops and supermarkets. The promanade is lined with fabulous restaurants which will suit every taste.Marina Rubicon which is only a short drive has a large range of designer shops (Lacoste, Burberry, Hugo Boss etc), also houses a large bowling alley and games arcade. Booking Notes: A 25% DEPOSIT SECURES A BOOKING WITH BALANCE PAYMENTS DUE 80 DAYS BEFORE ARRIVAL... SUMMER /CHRISTMAS AND EASTER PRICES ARE BASED ON UP TO 8 PEOPLE SHARING Changeover Day: The preferred day would be Thursday, but the owner will try and be flexible. Departure time for the villa is 10am.check in 3pm Notes on prices: Prices for the property are per week in euros based on 4 sharing. .FIRST child Under 2s are free. There is £200/€250 security deposit to be paid on arrival and will be refunded by home and away 7 days after departure when the property is handed over in good condition with no damage occurred. Peak period prices are based for up to 8 people ..